The complete electric underfloor heating solution for all laminate & timber floors. 130W/m2 Ecofilm kit, select the correct kit to fit the room for maximum floor coverage. Installation is completely dry & is a simple unrolling process. EcofilmSet comes pre-wired. Only a simple 2 wire electrical mains connection is required to provide gentle and safe heating comfort. EcofilmSet is rated at 130W/m2. EcofilmSet elements are ultrathin and have a minimum effect on finished floor levels; an important consideration when laying floating floors. 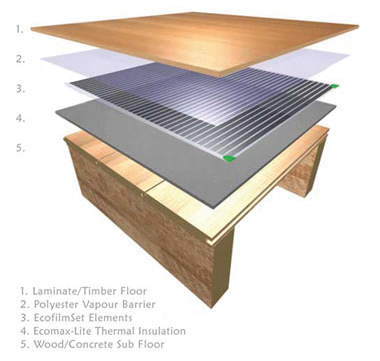 It can be laid on most subfloors; concrete or timber when used in conjunction with Ecomax-Lite Thermal Insulation. EcofilmSet comes with a 10 year guarantee against manufacturing defects. EcofilmSet Underfloor Heating Elements are very simple to install by following the comprehensive instruction booklet included with each element kit. The final electrical connections should be made by a qualified electrician in accordance with the current wiring regulations. All installations require a 30mA RCD (residual current device) for safe operation. All elements require connection to the thermostat via a standard junction box. 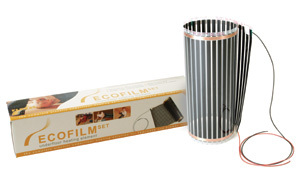 EcofilmSet is approved to the relevant International standard approval EN60335-2-96. Before laying the EcofilmSet on either a suspended wooden floor or concrete sub-floor it is necessary to install a layer of Ecomax-Lite Thermal Insulation. This will minimise heat losses and ensure quicker heat-up times for the floor. It will also act as a means of sound deadening which is required for laminate floors. Next roll out the pre-cut lengths of EcofilmSet taking care to locate the “cold tails” on the wall nearest the thermostat connection box. Trim to length as required and insulate trimmed ends as per instructions before taping the element into position. Never overlap the heating surfaces. Cover the total EcofilmSet installation with a layer of Polyester Vapour Barrier (PVB25) before laying the chosen floor covering.